These pharma-sponsored apps for baby care are useful, but are they social enough? Usefulness, the quality of an app that enables users to complete a practical task in a way that is significantly easier than their conventional approach to task completion. For example, a store locator feature is useful because with a single touch you can find the nearest store of interest, while on the Web you’d need to type in your location or skim over a list of store locations. Socialness, the quality of an app that enables users to interact with others in a way that is emotionally rewarding or useful; for example, sharing family photos or asking for help from a peer group. Of course other qualities such as entertainment value and usability are also important, but this post focuses on usefulness and socialness as they apply to the branded mobile apps developed by pharmaceutical companies for the baby care and baby development market, a global market worth over $44B US annually . In a study that measured physiological changes during the use of branded mobile apps , Dr. Potter concluded that a useful app "increases the general interest in the product category that you’re trying to sell, and the app also improves the attitude that you have toward the sponsoring brand … and the purchase intention that you have towards the product". With some carefully controlled research suggesting that useful apps increase marketing effectiveness, it’s safe to conclude that baby care apps will be more effective if they are more useful. It doesn’t take much persuasion to convince a brand manager that social access is important. The hype level on the subject is close to deafening. But while a Facebook or Twitter share button provide a superficial social component, deep socialness require that social features are directly integrated into an app’s functionality. For example, if an app allows you to post data it has collected and a related question to an interactive Web forum or Facebook wall, it will facilitate meaningful conversations and raise an app’s social value. If the conversation takes place within the app, it will also drive app adoption because the users have to download the app to participate in the discussion. This year’s Advertising Week in New York was full of presentations on mobile and social marketing. I attended one of these by Laura Simpson, Global Director of McCann Truth Central in which she shared some fascinating research results from their online quantitative study of 6,800 moms in developed and developing countries . The research suggest moms leverage their social network to solve the practical “mom” problems they face daily and paints a picture of the “mom economy” as an ecosystem in which switched-on moms exchange information and support and are socially rewarded for sharing. In her day-to-day activities, each mom accumulates a wide range of information, from food for their family, cleaning methods, party entertainment, child education and care, as well as shopping and accounting. The job, in other words, is a serious multi-tasking challenge. Not everyone can be good at everything, so most moms specialize in a few areas. 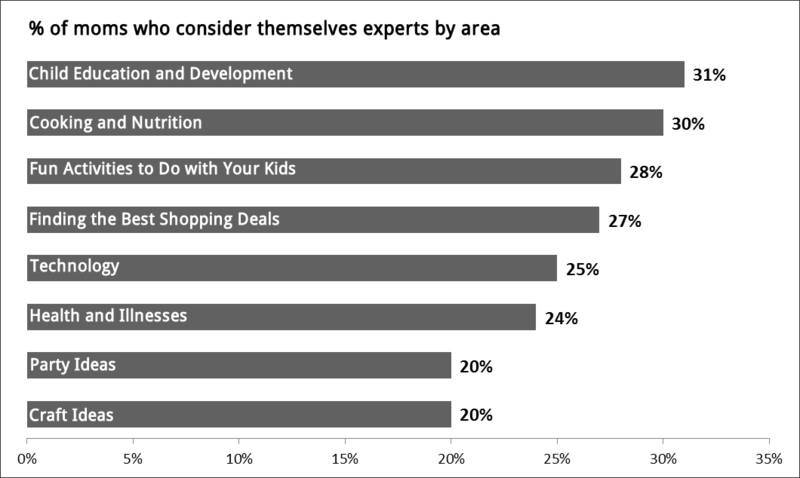 Figure 1 below shows the percentage of moms surveyed that regarded themselves as an expert in a particular area. Fig 1. Moms see themselves as experts in some but not all required areas. Moms bridge the expertise gap by getting together with other moms for advice, ideas, favors, and empathy. This creates a culture of community and sharing. Moms love to share: 88% of respondents said they want to share any interesting piece of information they come across and 37% said they would like to share it with as many people as possible. How are moms communicating to their community and conducting their tasks? Technology is increasingly being used as the medium for communication and data gathering: 84% of moms said that technology simplifies their life. In fact, so strong is their attachment to technology that 49% of married mothers preferred to save their communication tool, whether mobile phone or computer, over their engagement ring! Given that socialness will enhance the marketing effectiveness of any app, and the mom economy makes socialness even more important, designing deep socialness into an app should be a design priority. Apps that focus on baby care and baby development are rapidly becoming a popular category in mobile app stores. They are usually designed to address one or several daily baby concerns. Let’s look at the usefulness of the feature set and socialness of the design of five popular branded baby apps. This iPhone and iTouch app was built by the makers of Similac baby formula. 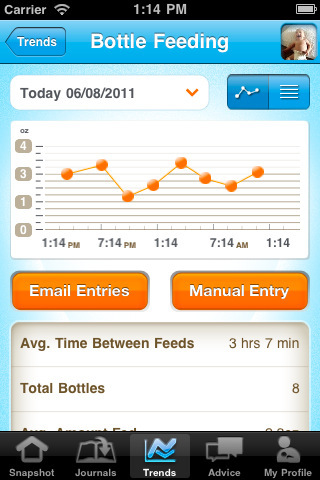 It primarily focuses on tracking baby feeding, sleeping, diaper changes, and growth. Tips and advice are thrown in as well. Fig 2. 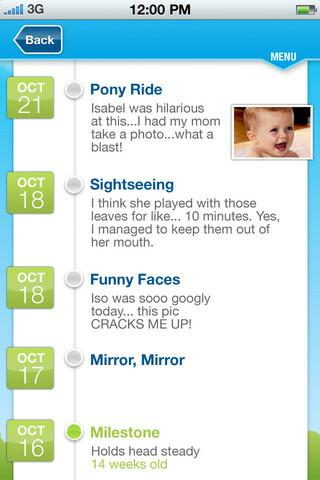 Similac Baby Journal: Tracking, displaying, and sharing baby care data. The app helps moms track their baby’s sleep patterns, breast feeding, bottle feeding, and diaper changes and displays the data graphically, which allows moms to improve their baby care routines. Moms can also email the information to their pediatricians, family, or friends. Usefulness: Moms inclined to track baby care data will find the app useful for data capture and data review. Socialness: The email sharing function facilitates social sharing. Socialness could be improved by allowing data to be shared app to app. For example, a Web or tablet-based app for pediatricians could receive data from the Baby Journal app, and further manipulate and display it in ways that would stimulate doctor-mom dialogue. We build branded pharmaceutical apps. Code Crew is a mobile/digital development shop offering a white label service to agencies & media teams. We build deeply useful & social apps that drive customer engagement. Check us out! 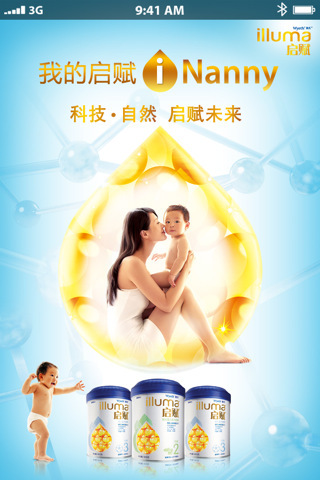 AmazingBaby is an iOS and Android app built by pediatric nutrition product maker Enfamil. The app focuses on child development and provides ways to monitor and structure play time and bath time. 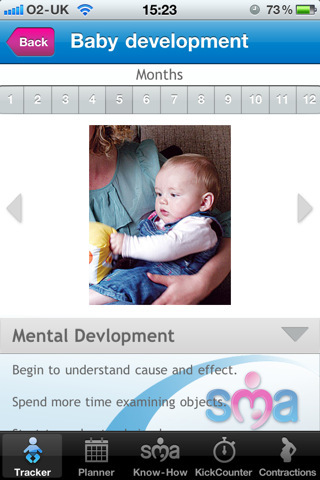 The app tracks motor, cognitive, communication, and social milestones. Fig 3. 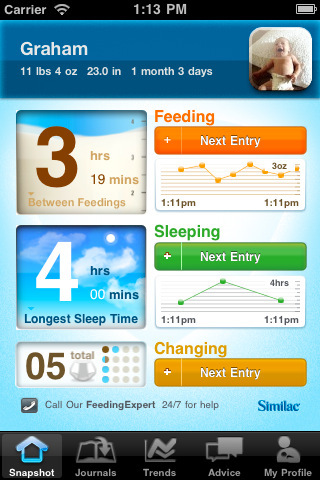 AmazingBaby Enfamil: Activity monitoring, capturing, and sharing child development app. 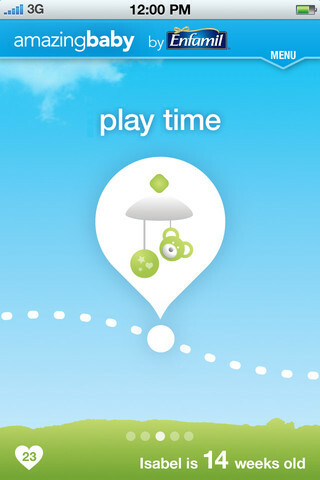 The app features are organized by "moment," defined as play time, fresh air, bath time, and quiet time. In all, 17 pre-programmed activities are designed to be fun and beneficial for a baby’s development. There are descriptions for each activity and the skills associated. You can snap pictures as you play and share them with friends and family over email and Facebook. There is also a "memories" timeline, organized by date, where you can see all activities played, milestones reached, and moments that could be interesting to re-visit when enough time passes. Usefulness: Moms inclined to track baby development data will find the app useful for data capture and review. Moms looking for new ideas of how they can interact with their baby to simulate development may also find the pre-programmed activities of value. Socialness: The social aspect of this app focuses on communications to family and friends over email and Facebook, mostly focused on photo sharing. The app adds some socialness value because these photos can be tied to a specific aspect of the baby’s development or developmental milestone, rather than generic photo sharing. 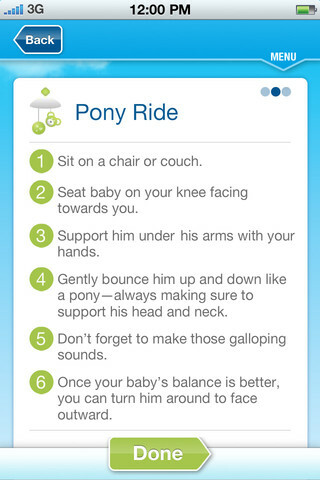 Built by Pfizer, I-Nanny is an iPhone app designed to provide expert baby care advice. The app covers warm care (growth tips and tracking), baby care information, and expert Q & A. 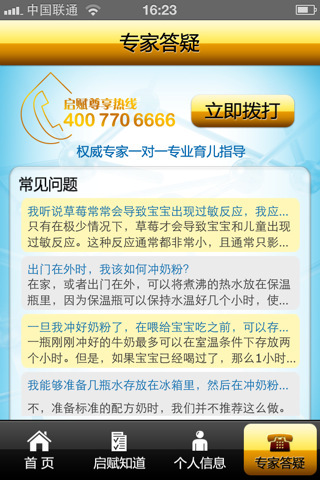 Figure 4 below shows some screens for the Chinese market. Fig 4. 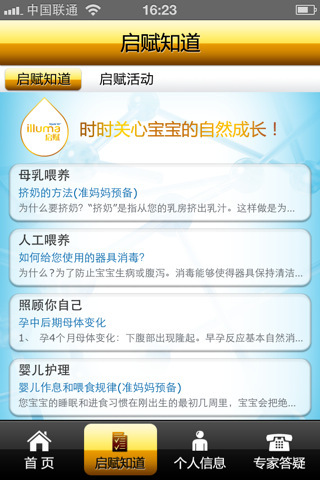 Illuma I-Nanny: Chinese informational and advice app. 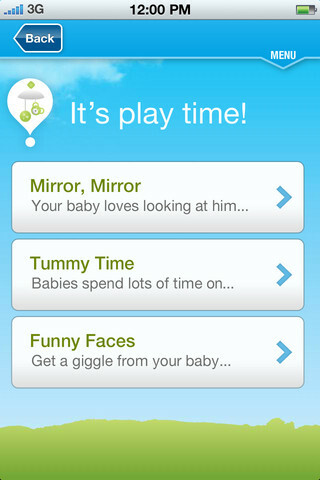 Illuma I-Nanny is primarily a reference app even if it provides some baby care tools. One very useful feature built into this app is that it provides opportunities for moms to interact directly with qualified medical and child care experts, but this is mostly a one-to-one communication. Moms can ask a doctor advice on different health issues relating to their baby. Usefulness: Having reference material close at hand is useful, but only marginally better than a reference book or computer. The build in advisory function is useful but presumably expensive to deliver. Socialness: The user-to-expert communication is a type of social interaction, but this app’s socialness could be enhanced if it also provided tools to access mom’s peer group. 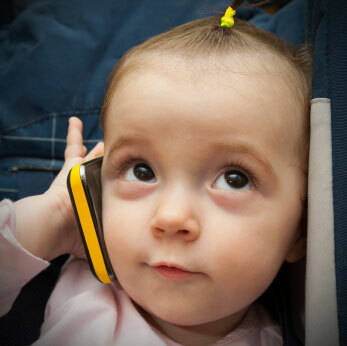 SMA Baby Know How is an English-language iPhone app built by Pfizer that focuses on baby care. 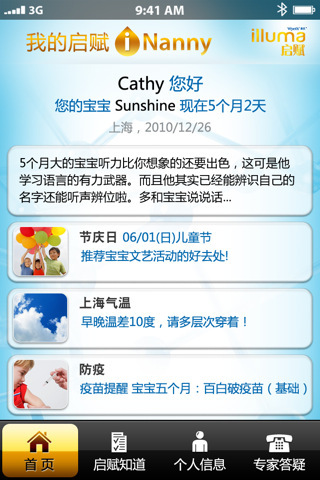 It has features that center on practical advice, as well as pregnancy and baby care tracking tools. 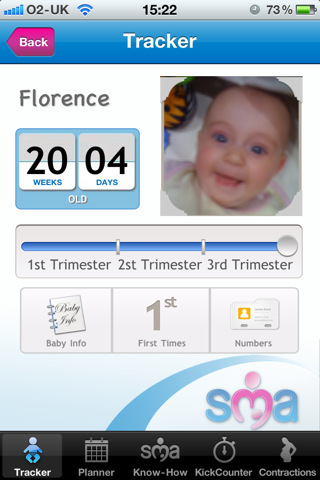 For pregnant women the app provides tools to countdown due dates, week by week guide to your baby’s development, a kick counter to monitor baby movement, and a timer to record length and intervals of contractions. Fig 5. SMA Baby Know How: Baby care and video sharing app. 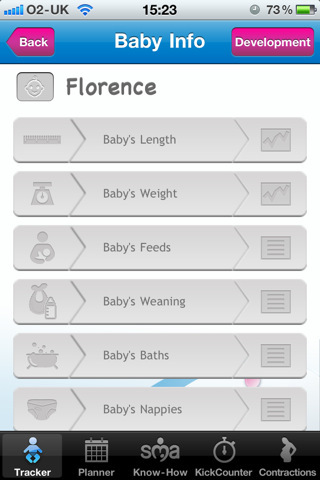 For newly delivered mothers the app provides a baby age counter, week-by-week guide to baby growth and development, a daily feeds and needs tool (including breast or bottle feeds, nappy changes and sleep), and a Baby First milestone tool, that track moments like first smiles, first steps, and sleep. The app also features practical advice and videos. Sharing again is limited to emails to mom’s friends and family, but this is a good way to make a baby’s development more social. Usefulness: The app is packed with features, many of which moms will likely find useful. Socialness: The email sharing function facilitates social interaction. Socialness could be improved by allowing data to be shared app to app. 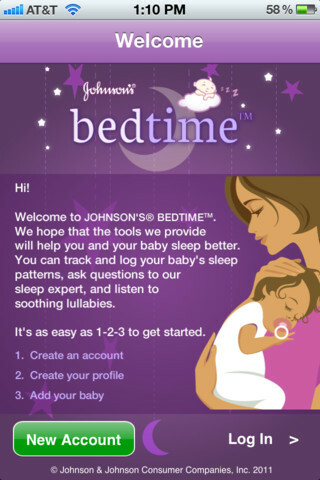 Bedtime Baby Sleep is an iPhone app built by Johnson & Johnson as a tool to help the 25-30% of babies that have trouble sleeping. I’m sure their sleep deprived parents are also grateful. There is a personal touch from the start, requiring parents to register online and create an account and baby profile. The app integrates the company’s three-step nighttime routine that helps babies fall asleep easier and sleep through the night better. Fig 6. Johnsons Bedtime: Sleep logging, habit, forum, and lullaby functions. The app provides parents access to the advice of sleep analysts, including Dr. Jodi Mindell, who are ready to provide expert advice on sleep-related questions. Johnson & Johnson claims to have a clinically proven method for babies to fall asleep easily and sleep through the night. App features include a sleep log, a three-step nighttime routine with instructive videos, and step-by-step advice, access to sleep analysts, lullabies and ambient sounds to help soothe babies to sleep. The app links to a forum for moms. 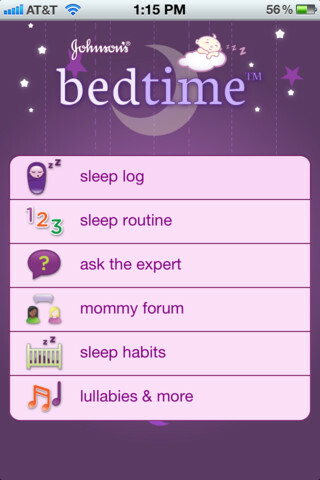 Usefulness: The app has a well-integrated set of features with a core focus on sleep, which moms will likely find useful. Socialness: Social aspects of this app are more diverse than the others surveyed here. In addition to one-to-one contact with a specialist, it has an integrated forum, which leverages peer-to-peer communication. Baby care and development apps are a great branding opportunity for pharmaceutical companies and other brands interested in accessing the mom economy. They can enhance a brand’s relationship with mom, the primary decision maker, gatekeeper, and brand ambassador to the market. Most of the apps outlined above accomplish this with high usefulness. They are packed with what are likely useful features. Unfortunately, most of the apps I looked at only scratch the socialness surface with basic features like email and Facebook sharing. Their marketing effectiveness could be greatly enhanced if app features facilitated sharing of rich information and easy dialogue in the robust mom economy, whether over the Web, Facebook, and Twitter, or within an app itself. Sharing over existing social networks like Facebook leverages their existing user base and infrastructure. In-app sharing drives app downloads and keeps customers fully focused on the brand message within the app. Given the importance of the sharing to the mom economy, this kind of deep socialness can make the difference between a somewhat effective branded app and a highly effective branded app.